How many chromosomes are found in a normal human body cell? "To get a good understanding of DNA" Watch this online video on DNA structure and replication and complete the quiz at the end. DNA is a complex molecule found in all living things. The primary function of DNA in organisms is to store and transmit the genetic information that tells cells which proteins to make and when to make them. DNA and RNA are polymers, complex molecules composed of repeating subunits. The repeating subunits in DNA and RNA are called nucleotides. In 1953, James Watson and Francis Crick proposed a model for the DNA molecule that consisted of two nucleotide chains that wrap around each other to form a double spiral. This shape is called a double helix. The picture at the top of this page represents a double helix. Ribose - a 5-carbon sugar in RNA. This sugar has more oxygen than the sugar in DNA. 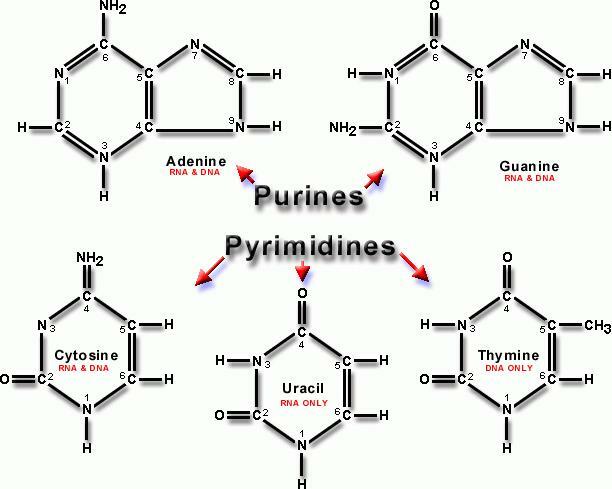 Purines - have a double ring of carbon and nitrogen atoms. Pyrimidines - have a single ring of carbon and nitrogen atoms. Thymine is replaced by uracil in RNA. Base-pairing rules: these rules describe the behavior of the bases. Cytosine always bonds with guanine by forming three hydrogen bonds. Adenine always bonds with thymine by forming two hydrogen bonds. A pair of bases that always bond together is known as a complementary base pair. An average cell nucleus is about 6 micrometers in diameter. The total length of the DNA in a human cell is 2 meters when stretched end to end. For DNA to fit in a nucleus, there must be several levels of coiling and supercoiling. a coiled, double rod-shaped form of condensed DNA that forms during cell division. DNA is normally found in long strands in the cell nucleus. The coiled structures we call chromosomes are found in cells only during cell division. DNA is duplicated prior to cell division. When the chromosomes form, one side of each chromosome consists of the original cell DNA while the other side consists of the duplicated DNA. One half of each chromosome goes to both cells during cell division. This insures that the new cell will have exactly the same genetic make-up as the original cell. Every species has a distinct number of chromosomes. Humans have 46 chromosomes (23 pairs). Gene - a segment of DNA on a chromosome that controls a particular trait. Allele - any of the several alternative forms of a Gene. Chromatid - one of two identical halves of a chromosome. Homologous chromosomes - the two members of each pair of chromosomes. Diploid - 2N - a cell that contains both chromosomes of a homologous pair. Haploid - N - a cell containing only one chromosome of a pair. RNA is responsible for the movement of genetic information from the DNA in the cell nucleus to the site of protein synthesis in the cytoplasm. RNA's sugar molecule is ribose instead of the deoxyribose sugar in DNA. Messenger RNA - mRNA - a single uncoiled strand that transmits information from DNA to the ribosome during protein synthesis. Transfer RNA - tRNA - a single folded strand that bonds with a specific amino acid. Ribosomal RNA - rRNA - a globular form that is the major constituent of the ribosome. Protein synthesis the formation of proteins using information coded on DNA and carried out by RNA. Transcription - the process of forming a mRNA strand from a DNA strand. The DNA double strands are separated and a mRNA strand is formed by RNA bases pairing up with the exposed DNA sequence and each base linking to the next. The mRNA that is formed carries the genetic information that will be translated into a protein. The rate of transcription is about 40 nucleotides per second. Translation the assembling of protein molecules from information encoded in mRNA. DNA duplicates itself in replication. DNA produces RNA in transcription. RNA produces proteins in translation. "To review protein synthesis " Watch this online video on transcription and translation and complete these video questions . Honors biology: complete part 1 number 1 below and the Honors biology section, "What will your DNA do today?" What was the intended purpose of the U.S. Immigration Act of 1924? How many U.S. states had compulsory sterilization laws in 1931? The first recombinant DNA molecule was produced in 1972 by what person? What event happened in 1978 that can be considered the dawn of biotechnology? How did the U.S. Army begin using biotechnology in 1992? In what year did scientists first successfully transfer DNA from one life form into another? What is the primary function of DNA? How long is your DNA? Explain how this can fit in the nucleus of your cell which is about 6 micrometers in diameter. The nitrogen bases of DNA always combine in specific pairs. Which bases always bond together? This is called the base paring rule. Sketch a drawing of a segment of DNA with 5 paired nitrogen base. Label all parts of your sketch. How are purines and pyrimidines related to the base paring rule? Who discovered the base paring rule? Remember the S phase in the cell cycle? What is taking place in this phase? The following is how it happens: Use this DNA workshop site to complete the replication process and copy the sequence of the replicated DNA here. Describe in your own words how DNA replicates itself? Where does protein synthesis begin? Where is the information stored that is used to make proteins? What does the animation say happens during transcription? What does the promoter do? What is the coding region? What signals the end of the gene? h. What does mRNA do with the encoded information after transcription? i. What molecule reads the mRNA? j. What is a codon? k. What is the start codon? l. What does a tRNA look like? What is its function? m. How do codons and anticodons work together? n. As the strand moves what is being produced? o. What finally ends the strand? p. What has been made from this process? q. Can this be done in multiple sets? r. What have you just watched in these animations? Why are the base pairing rules a little different between DNA replication and RNA transcription. Using information from number 1: How are the nitrogen bases in RNA different from the nitrogen bases in DNA? What are the three different types of RNA? Describe the function of each type of RNA? Explain how ribosome's are involved in translation. Explain why proteins are important in your body? Honors Biology : What will your DNA do today? To help you answer this question visit this web site and complete this hand out. Word doc. Once at the web page use the lower left arrow to navigate to different scenes. Follow the directions on the hand out. Honors Biology: read concepts & reviews 1-6 complete each practice (1-6) and self quiz - use print screen & paint to place graphics in assignment type out all other written answers. Regular Biology: read concepts & reviews 1-4 complete each practice (1-4) and 1- 11 on the self quiz - use print screen & paint to place graphics in assignment type out all other written answers. Honors Biology: read concepts & reviews 1- 7 complete practice (6) and self quiz (1-3) - use print screen & paint to place graphics in assignment type out all other written answers. Regular Biology: read concepts & reviews 1- 7 complete practice (6) and self quiz (1-3) - use print screen & paint to place graphics in assignment type out all other written answers. Honors Biology: read concepts & reviews 1-14 complete practice (13) and self quiz - use print screen & paint to place graphics in assignment type out all other written answers. Regular Biology: read concepts & reviews 1-14 not 5,6,10, complete practice (13) and self quiz (1,2,3,6,9,10) - use print screen & paint to place graphics in assignment type out all other written answers. A normal human body cell has 46 chromosomes.